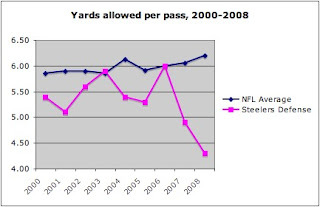 In our statistical analysis of the 2007 season we observed that the Steelers' defense had shown tremendous improvement in its pass defense, pointing out that the 4.9 yards they surrendered per pass last season was the second lowest such number given up by any time in the eight seasons we examined. The 2008 Pittsburgh defense decided to do something truly special. This past season the Steelers' defense surrendered an average of 4.3 yards ~ the lowest seasonal average of any team in the past nine NFL seasons. The next best average this season was Baltimore at 5.10 yards per pass; and the next best average during the past nine seasons was achieved by Tennessee (4.7 yards) during the 2000 season. We have mentioned the 2001 Steelers' defense a number of times, and that one was superior in some ways to the 2008 defense. However it must be noted that only twice in the past nine seasons has the defense held opponents to less than five yards per pass, and that was the 2007 defense and the 2008 defense.